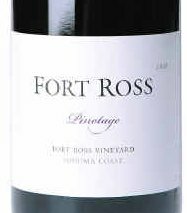 "Fort Ross 2002 Pinotage, one of only a handful produced in California, is a marvel. Deep inky purple, it gives off concentrated aromas of dark red fruit – dried strawberries, blackberries, black cherries – spiced with white pepper and infused with smoke. The fruit grows luscious, creamy and mouth-filling but not in a big-wine, jammy way. Rather, it's like dipping through layers of mousse, with dry tannins and nice acidity that roll to a chewy finish." I have not tasted Fort Ross's Pinotage -- yet! (I must get back to California soon ), but don't you just want to drink that wine after reading Kim Pierce's review in Dallas News? Kim tells us that Fort Ross's owners Lester and Linda Schwartz came from South Africa, and that they imported the vines from there and had to wait 5 years for them to clear quarantine. The wait was worth it. Love the story behind the vines - its what makes drinking wine so enjoyable for me- the history and story behind whats in the bottle!! great stuff!! Have you heard of The Stables Pinotage? The first wine to be produced by a KZN midlands winery!!! not outstadnign but they are pioneers in the area and will be interesting to see if any more wine farms pop up in the area!! It's not the first wine we have produced in KZN, we have also produced award winning Sauvignon Blancs, that have been likened to Cloudy Bay in Marlborough..as we produce wines typical of cool climate regions..